Sometimes it’s necessary to control devices from remote, like the solenoid valve for watering the garden or the garage lights, which are already controlled (on-off) through the classic electrical switches. 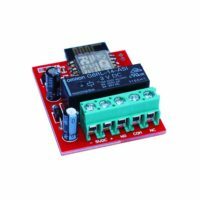 In this article we’ll see how to connect the RLY-1601 board to these particular systems. WARNING: Using devices and handling high voltage cables is extremely dangerous. The types of connections written in this article could damage your devices permanently. The information in this articles are only for educative purpose. The user is the only responsible for any kind of damage. If you don’t know exactly what you are doing, please call an electrician. Let’s consider, for example, that you want to switch the home entrance light on or off with a smartphone, using RLY-1601. Besides let’s consider that the lamp is controllable by one switch as shown in the figure below. Now we’ll see the possible configurations and their peculiarities. In this configuration the lamp is on only when both the switch and relay on board of the RLY-1601 are closed. When the relay is open the lamp is surely off independently by the state of the switch. When the relay is closed the lamp is fully controllable by the switch. When the relay is closed it is impossible to know if the lamp is on or off from remote. This configuration can be used when it’s necessary to enable or to disable a device, which is directly controllable with a switch, from remote. In a tourist home, for example, the owner can enable from remote a device that the user can use for a specific amount of time. When the device is enabled the user can turn it on or off with the switch. After this time the owner can open the relay from remote to disable the device. In this configuration the lamp is surely on when the relay is closed independently by the state of the switch. When the relay is open the lamp is fully controllable by the switch. When the relay is open it is impossible to know if the lamp is on or off from remote. This configuration can be used when it’s necessary to turn on a device independently by the state of the switch. With this configuration it is possible, for example, to turn on the garage lamp from the car before going back home independently by the state of the switch inside home. In this configuration the SPST switch has been replaced by a SPDT switch. The lamp is controllable independently both with the switch and with the relay. It’s impossible to know if the lamp is on or off from remote. 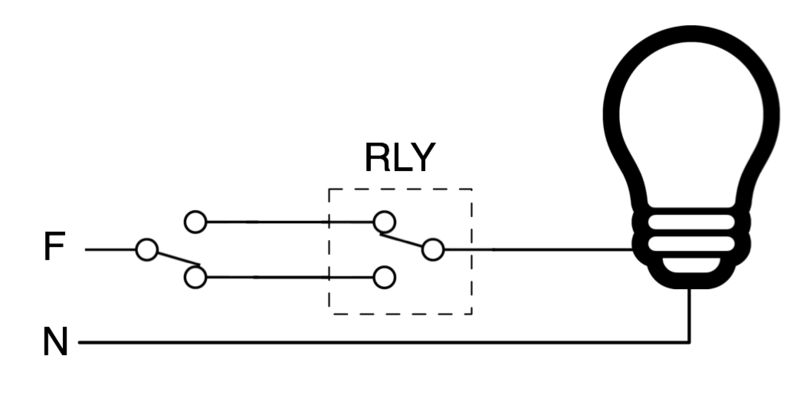 This configuration can be used when a device must be controllable independently both with the switch and with the relay. In this configuration, for example, it’s possibile to turn on or off the abat-jour in the living room both from the wall switch or from smartphone without the need to stand up from the couch.